Smack-dab in the middle of Chicago, we here at LCWA know a thing or two about snow. LCWA recently worked with client Snow Joe to launch the first cordless two-stage snow blower powered by lithium-ion batteries. The winter program targeted top outlets across the United States and Canada, touting product attributes like ease-of-use, tech innovation and power while still being green and battery-powered. These angles, along with timely media relations surrounding regional snow storms, gained media attention resulting placements such as Men’s Fitness Ultimate Gift Guide for Dad, a Popular Mechanics tech feature, a winter gadget listing in The Philadelphia Inquirer, The Cleveland Plain Dealer’s Product of the Month and an on-air segment on NBC News Chicago featuring one of our very own account members demonstrating the product on the streets of Chicago (now that’s going the extra mile for a client)! 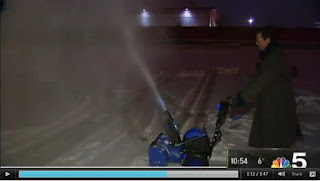 With winter almost over, the program has generated 14.9 million impressions positioning Snow Joe as the leader in electric snow clearing technology—proving the power of the snow blower, the power of the brand and the power of good strategy.